NUPROL DELTA - Nomad Bravo (Black). 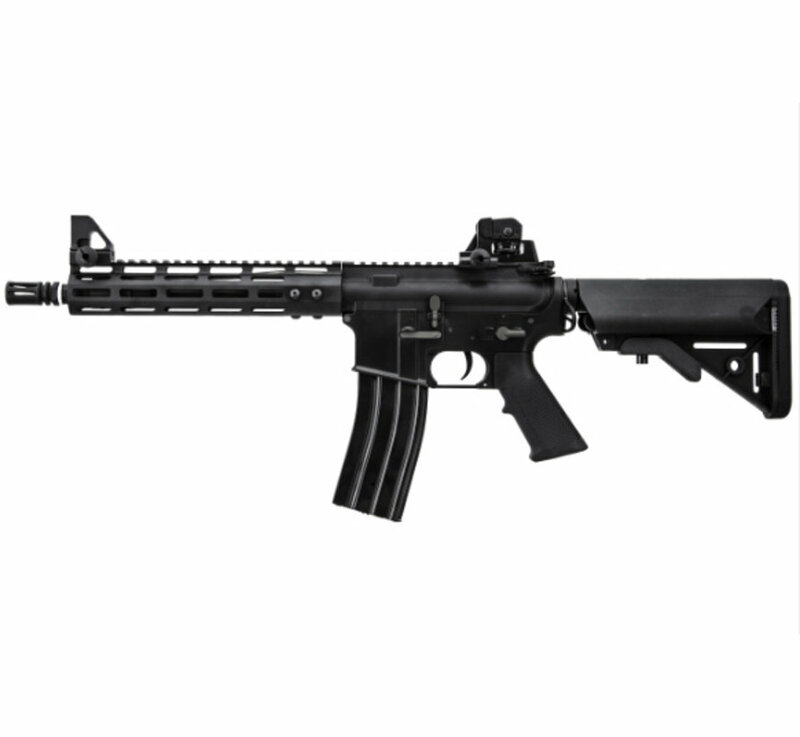 NUPROL - DELTA Nomad Bravo AEG Rifle - Black is a new 6mm electric airsoft rifle manufactured by NUPROL, designed on a customised M4 MK18 SFW with M-LOK system, and is ideal for those in need of a compact, CQB friendly M4. Straight out of the box the Nomad Bravo has a fantastic list of High Quality features not usually seen on weapons in this price range. The Nomad Bravo is rock solid, being constructed largely from CNC Alloys, with only the Pistol Grip and 6 position Crane Stock being Lightweight Polymer. 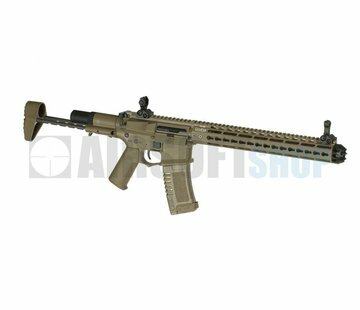 Additionally, the Alloy components feature an incredibly resilient and tough Case Hardened exterior, having undergone a Quench-Polish-Quench (QPQ) process during manufacturing; resulting in Alloy components which will be more than capable of withstanding a fast-paced action-filled day Airsofting. 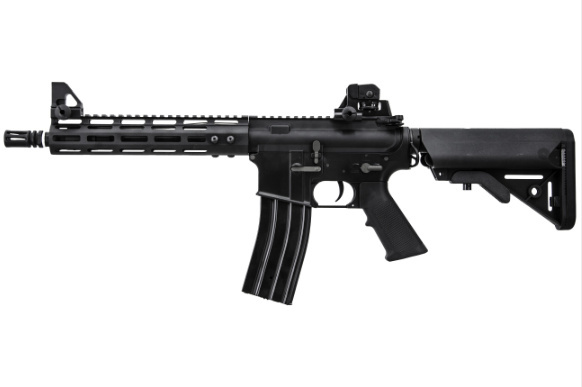 The usual Handguard has been Updated, with a M-LOK Modular Weapon Interface system replacing the traditional M4 type handguard; allowing Airsofters to mount a variety of accessories on the Bottom and Sides, such as Grips and Light Modules, in a way which is Rock Solid. 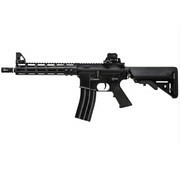 The M-LOK system also offers users a vastly more Ergonomic Point of Contact for hands than a traditional RIS Handguard. However, 2 Side and 1 Bottom 20mm RIS Rail Panels have been included should you wish to install them, allowing you to mount any RIS Compatible accessories you may already own. Dedicated to realism, theres even a Replica Low Profile Gas Block and Mock Gas Tube hidden in the Handguard. The high end features continue Internally as well, with reinforced V2 gearbox boasting a quick change spring, full steel tooth piston, micro switch trigger and high torque flat motor. 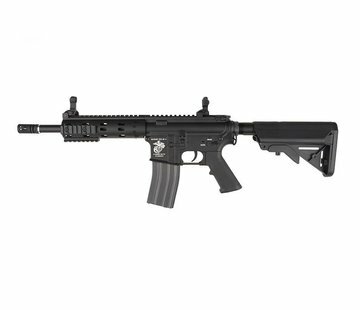 If youre in the market for a modern, completely Modular, Short Barrelled Compact M4, then the Nomad Bravo offers practically everything beginners and old-hand Airsofters could possibly want, with high quality construction and top end features, at an affordable price, it will make a perfect addition to any armoury.